The Museum is very excited about the addition of some rare, German toy steam engines for 2014! They are intricate, highly detailed and fully functional works of German craftsmanship. It’s hard to believe they are a child’s toy! Such toys would have familiarized children with the concepts and principle of steam power, skills that would have potentially proved useful in a increasingly industrialized world. 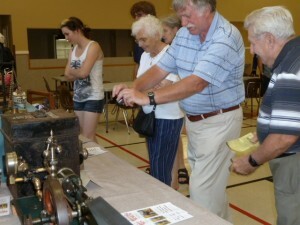 Horseless Carriage Museum gathered together with other community groups this past Saturday, July 20, at Honouring The Past. It was a great day to bring awareness about local history to the friendly and curious folks of the Kawartha Lakes region. Some wonderful memories were shared, new friends made, and fascinating stories discovered!! Now the fun research of these “leads” begin!! Playing a tune on the mechanical music machine. 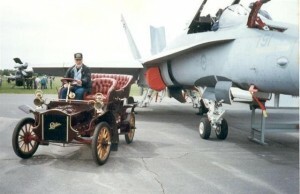 Horseless Carriage at an Air Show! Time flies! Literally! And, it becomes very obvious when you start flipping through the old family albums. Recently mom “rediscovered” one of her favourite pictures of dad, taken about 18 years ago when they attended the Bracebridge Air show. Another quick shot before being "escorted" of the Tarmac ! When mom and I took the Museum ” on the road” for the Honouring the Past heritage day at the Lindsay Armories in Kawartha Lakes, we were delighted to meet a lovely lady by the name of Phyllis McHale. Phyllis is a member of the Norland Women’s Institue, and organized a visit to the museum for her group of ladies, and all arrived very enthusiastic. In the beginning, the Horseless Carriage was a considered a “Man’s domain”. 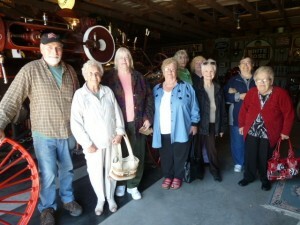 More recently ,the ladies and women groups are discovering the Horseless Carriage is not just for men. Before we asked the men to bring the Women to promote the museum. Now we ask the women to bring the Men! Dad and the Ladies in front of the 1895 Sawyer & Massey Steam Traction Engine. 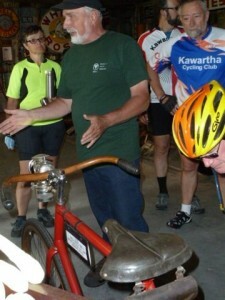 On May 23, 2013, we were honoured to welcome the Kawartha Cycling Club as they toured the museum. The group of 17 cyclists, organized by Arthur Hornibrook, cycled to the museum despite the threatening weather. The group made good time arriving only 5 minutes later than scheduled for the Red Rock Loop. The exception was Harriet who took a short cut and arrived 15 minutes early! Group preparing to leave after Arthur gives the group detailed instructions for the trip back . Another Kawartha Lakes Rarity! The E&D Bicycle. This is the second of the two bicycles purchased from Burrit Kerr’s Auction. 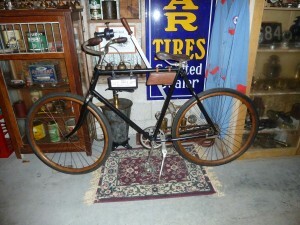 This rare 1897 E&D was made by the Evans and Dodge Bicycle Company in Windsor. machinists for the Dominion Typograph Company in Windsor, Ontario. bicycle. 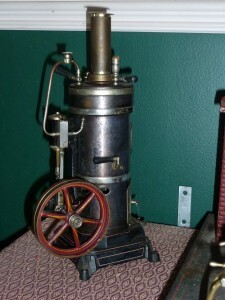 Their talent as machinists was soon recognized by a Detroit businessman, Frederick Evans. Together they organized the Evans and Dodge Bicycle Company. The bicycles were “safety” bicycles, with wooden wheels, wooden handle bars and a skip tooth chain. The head badge of the bicycles was a metal emblem with the letters E&D intertwined on a Maple Leaf, giving it the nickname ” The Maple Leaf Bike”. 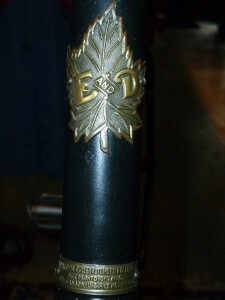 E&D was only in production for two years before the company was sold and incorporated into CCM in 1899, thus it is unlikely there are many examples of this bicycle with the “E&D” Maple Leaf Badge, before it was changed to bear the CCM logo. machine shop back in Detroit. They began to supply parts and assemblies to Detroit’s growing autoindustries . After years of fulfilling large contracts for such giants as the Olds Motor Vehicle Company and the upstart Ford Motor Company, the brothers decided to use their own clever resources to produce their own complete vehicle in 1915 and the Dodge Brothers Motor Company was born! We are so very pleased to be able to save and share such a monumental step in Industrial history! It also has a very significant local history, as Burrit recalls it belonged to Bobcaygeon’s Post Master, and was proobably bought from the same retail agent as the “Red Bird” Bicycle! 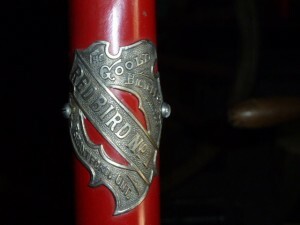 The "Head Badge" on the 1895 Red Bird no.1 shaft drive bicycle. The Red Bird no.1 shaft drive bicycle. In my previous post, I had talked about the great importance the Red Bird had to local history. 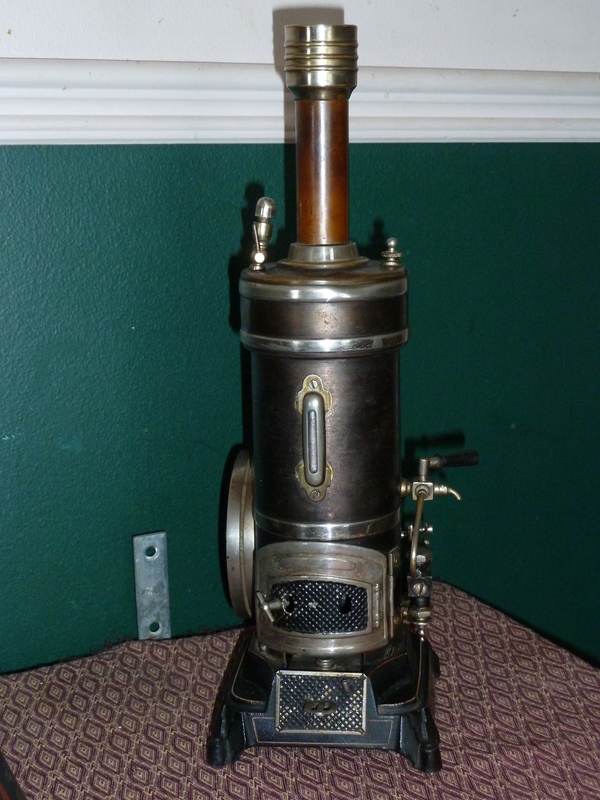 Since it’s purchase we have discovered just how extremely rare it is, and it’s fascinating place in Canada’s industrial history at the turn of the 19th century. 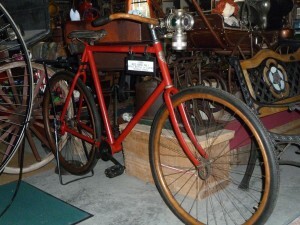 This Red Bird was built in 1895 by Edward E. Goold, who formed his bicycle company in 1887. Mr. Goold also belonged to another important and history making / altering company “Goold, Shapely & Muir”. GS & M manufactured Windmills, water pumps, kerosene and gas engines, and some of the first tractors (just to name a few) that helped shape the industrial and agricultural face of this country! Based in Brantford Ontario, they also had locations in Winnipeg and Regina. Our little Red Bird was an important beginning to a company that helped develop this great country! An interesting side note, Edward E. Goold sold his bicycle company in 1899 to Canada Cycle and Motor Company ( CCM ) of Toronto. Now I think we are all familiar CCM bikes! Who among us hasn’t ridden one? The Red Bird No.1 was classified as a “safety” or “low wheeled” bicycle . It has wooden wheels and handle bars, but most interesting is how the back wheel is “driven”. We all are used to the typical chain drive bicycles, but the Red Bird is driven by a shaft drive, NO CHAIN ! This 1895 Red Bird no.1 is possibly the oldest and only existing example of the shaft driven bicycles made by the Goold Bicycle Company. 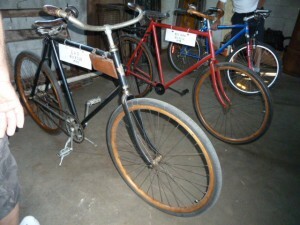 As can be seen on the bicycles “head badge” it was definitely manufactured by Goold, before is purchase by CCM in 1899. An 1898 advertisement shows that C. Moore was an agent for Brantford Red Bird bicycles in Bobcaygeon. In all the research that has been done since the purchase of the Red Bird, it has become apparent that this is probably the ONLY Red Bird no.1 shaft drive in existence right now! Many cycle enthusiasts, historians and collectors have come to see this bike, many of them in complete disbelief, claiming “there is no such thing as a Red Bird no.1 shaft drive”. One fellow got down on the floor to look for weld marks on the shaft because didn’t believe it could be authentic! Well, she is 100% authentic. And for those who say that such a bike does not exist….nothing exists until it is found! 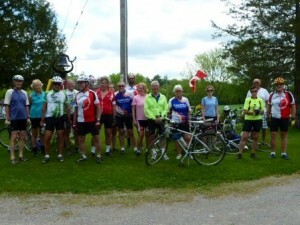 Cycling in the Kawartha Lakes – Vintage Style! 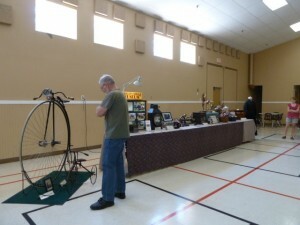 The E & D (improperly dated in this picture) and the Red Bird, antique bicycles at Burrit Kerr's auction, Kawartha Lakes. The Head Badge of the 1895 Red Bird No. 1 shaft drive bicycle. As cycling becomes more and more popular, (especially in a tourist destination such as ours that offers beautiful cycling routes) I thought I would talk a little about the bicycles in our Collection. The bicycle has a long and important history, and we are proud to have not only one of the earliest representations of the bicycle, the Penny Farthing, but two very rare bicycles with extreme local significance. Many years ago, Dad became friends with a fellow antique collector by the name of Burritt Kerr who was a bit of a local legend and historian. He and Burt would spend hours talking about their interests, and their “finds”. On one of these visits Burt showed Dad a pair of bicycles he had clandestinely removed from the neighbour’s garbage, in original condition. He was aware of the origins of both the ” 1895 Red Bird” and the ” 1897 E & D” and of their importance to local history. It is presumed that both bicycles were sold by the C. Moore company in Bobcaygeon, an 1898 advertisement shows that C. Moore was an agent for Brantford’s Red Bird bicycles in Bobcaygeon. We’re not sure if there is a direct connection to the Moore carriage shop which stood for many years at the present site of the CIBC bank. Burt knew that the Red Bird had been owned by the first Lock Master of Lock 32 in Bobcaygeon. Lock 32 was the first set of locks to be built in the Trent Severn Waterway in 1883. Thus the Red Bird is forever linked to significant local and Canadian History! The “E & D” bicycle also belonged to a prominent community member of that time, the Post Master , and may have been purchased from the same agent in Bobcaygeon as the Red Bird. Burt may not have been aware of their importance to Canada’s industrial history, or of their extreme rarity at that time, but he proudly shared the story with whomever showed an interest. He even went so far as to allow them to stand on display at the Horseless Carriage Museum for a year to further educate the public. Very sadly, Burt passed away in November 2011 at age 87. His wife Millie, after months of tough contemplation, decided to auction off Burt’s collection, as they had no children to carry on with it. 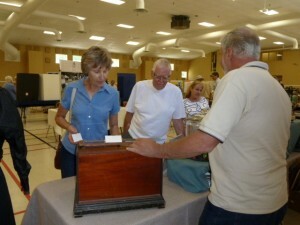 Civic Holiday Monday (July 2, 2012) was the estate auction of Burritt Kerr of Bobcaygeon presided by Kevin Barker. 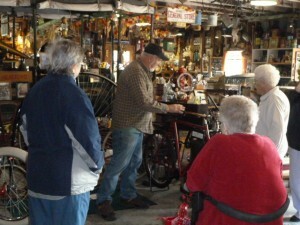 The highlight or feature of the auction was expected to be Burritt’s two prized bicycles, the Red Bird and the E&D. Of course Dad had every intention of bidding on the Bikes, both for their historical as well as sentimental value. His stiffest competition would be bidders from Pennsylvania, Brantford and Windsor, all private collectors or Museum representative. Burt’s collection was very large, 300 + cookie tins (Danish Butter cookies, Burt’s favourite) of small trinkets alone!! Thus it was well into the afternoon when the bicycles came up for bid. At the risk of sounding cliched, the bids came fast and furious, and the price soon climbed higher than anticipated. Dad was holding the higest bid at $5100…..SOLD. The auctioneer said it was by choice, “Pick one or take ‘em both”. Dad’s first choice was the Red Bird, ( for reasons that will be discussed in a later blog) but knew that if he didn’t speak up, the E&D would likely end up in the US, and that would be shameful! So, to the crowds utter surprise, he said he wanted them both….at $5100 EACH! Many collectors and bicycle enthusiasts crowded ’round as the bikes were loaded for home, trying to get pictures of the unique features possessed by the rare bikes and their “head badges”. This piqued Dad’s curiosity. He had bought the bikes for their local historical significance and general rarity, but he was soon to discover their true Canadian historical importance!! Lang Pioneer Village Choice Trophy presented to the Bennett boys, representing Horseless Carriage Museum. On June 17th, Father’s Day, Horseless Carriage Museum set out for the annual “Smoke & Steam Show” at Lang Pioneer Village in Keene. Three generations of Bennett’s attended with displays from the museum. 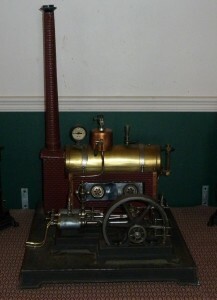 Featured were the 1878 Penny Farthing Bicycle and the 1899 Stanley Steam Car. Both were a big hit with the Steam Car receiving the “Village Choice” Award for favourite historical piece. The youngest Bennett boys proudly pose with the ” Village Choice” trophy. This was a well organized and enjoyable event! Hope to return this year! 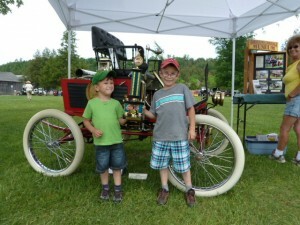 This past summer the Horseless Carriage Museum attended the Lindsay Lilac Festival in the Kawartha Lakes Region. 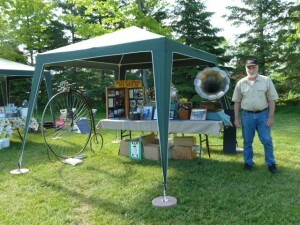 It was the first public display of both the 1878 Penny Farthing Bicycle and the 1906 Columbia Graphaphone. 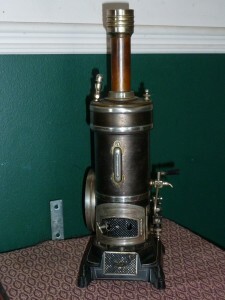 Both are new and notable pieces for the Museum. The Penny Farthing was an unforgettable icon of the 1800’s, and the 1906 Graphaphone had the largest horn produced by Columbia, perfect for projecting loud, crisp music in a “garden party” type atmosphere such as we were attending. It was very touching and entertaining to watch couples, young and old, dancing on the lawns to the period music of the Graphaphone. 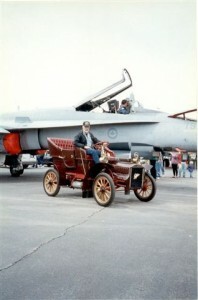 This was one of first “promotional” endeavours for 2012 in order to promote Horseless Carriage Museum to the public. Hopefully we will undertake more public appearances in this coming year! Watch for us! Hope to see you soon!